Full Description: Premier Houseboats are pleased to present River Oak, a good sized one bedroom houseboat, in need of finishing, which has become available due to the owners change of circumstances. River Oak was purchased as a disused and dated houseboat, and then completely gutted. She has been insulated throughout, and completely rewired. She has also been part plumbed. She has been partitioned to create a good size double bedroom, open plan kitchen/lounge and a shower room. These partitions need boarding out. There has been a new Gas Combi Boiler fitted, and the shower, hand basin, toilet and macerator unit are boxed and on the boat ready to be fitted. The piping for radiators is also on the boat. The current owner will be fitting four new windows at the front of the boat and one at the side. There is some welding needed along the waterline, and she is currently out of the water to enable any purchaser to do this work. 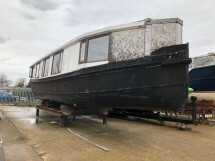 River Oak offers the potential to be a good sized, and very light, static houseboat, with an estimate of £15k- £20K to finish her. Her size means that ongoing costs such as mooring fees and heating will be very much affordable, but do not compromise the excellent living space available. 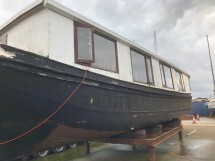 Vessel name: River Oak Vessel condition: Fair Year constructed: 1930 Year refitted: 2018 Berths: 2 Cabins: 1 Heads: 1 Length over all: 50' Beam: 11' Maximum draft: 1' 4'' Hull material: Steel Hull type: Flat Hull colour: Black Disclaimer Premier Houseboats offers the details of this advert in good faith as it was presented by the seller or his representative but cannot guarantee or warrant the accuracy of this information nor warrant the condition of the described item within this advert. A buyer should instruct his agents, or his surveyors, to investigate such details as the buyer desires validated. The Item described within this advert is offered subject to prior sale, price change, or withdrawal without notice.